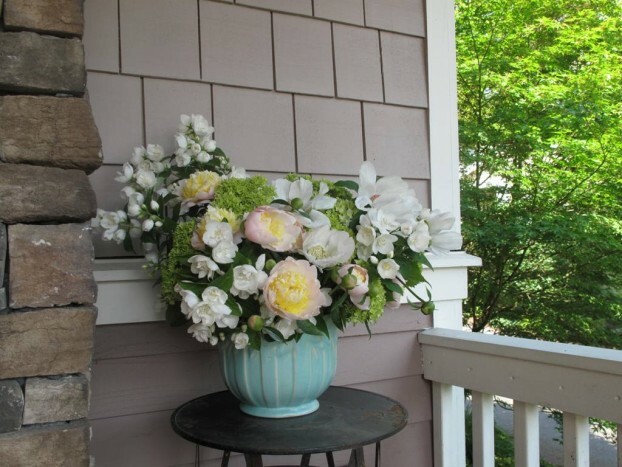 Back Porch Bouquet – with every bloom clipped from my garden. 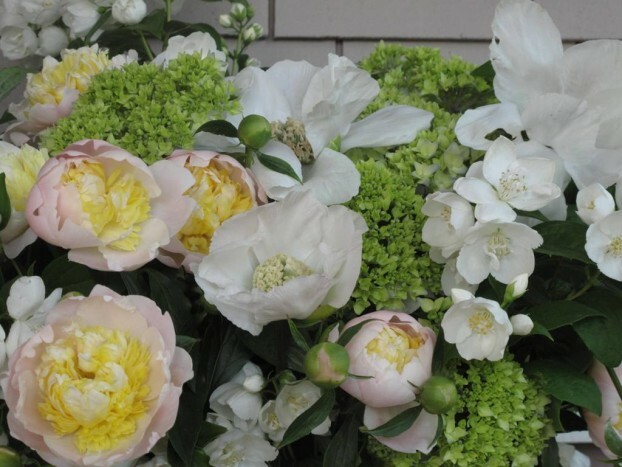 I wish you could inhale the light fragrance of the peonies combined with the sweetly scented mock orange blossoms (Philadelphus coronarius). Wow! It’s a perfect pairing to grace the small table in our home’s entry, allowing me to share the garden perfume and perfection with anyone who might stop by this weekend. 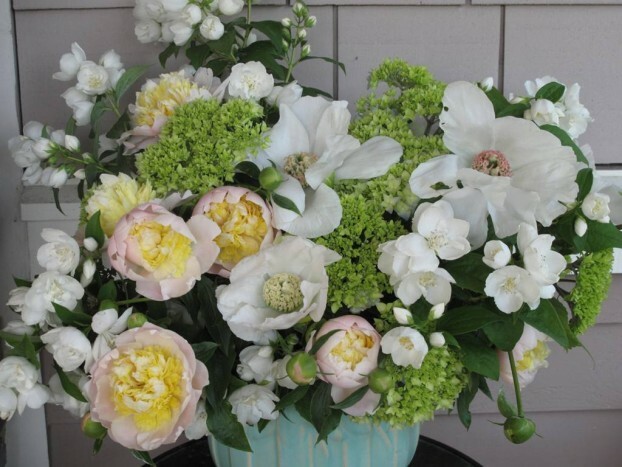 Two types of peonies, a profusion of mock orange, and young hydrangea buds. I especially love using this vintage American-made vase. 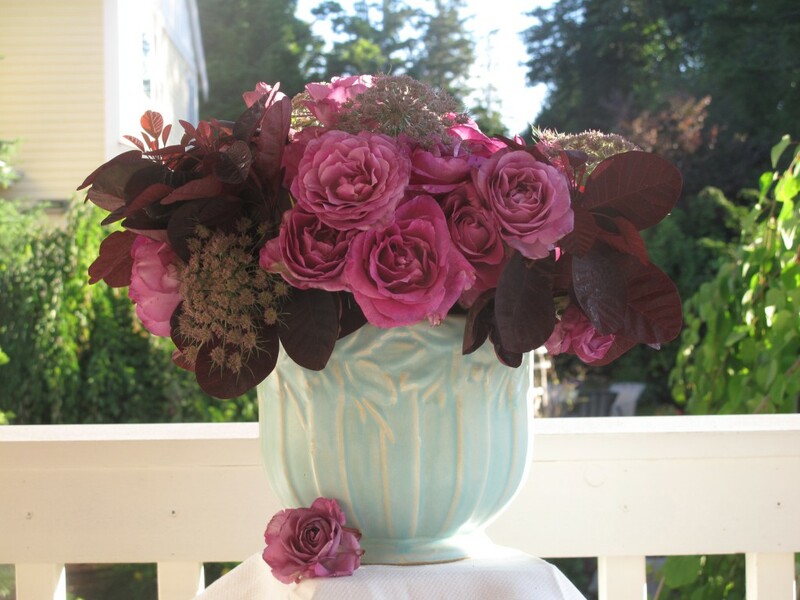 It is also featured on pages 50-51 of Slow Flowers, where it holds beautiful garden roses that I paired with smoke tree and the ‘Black Knight’ Queen Anne’s lace. The 7-inch tall McCoy jardiniere is from the 1940s era and has a raised design of vertical bands (maybe suggesting picket fencing?) and a rim of flowers. 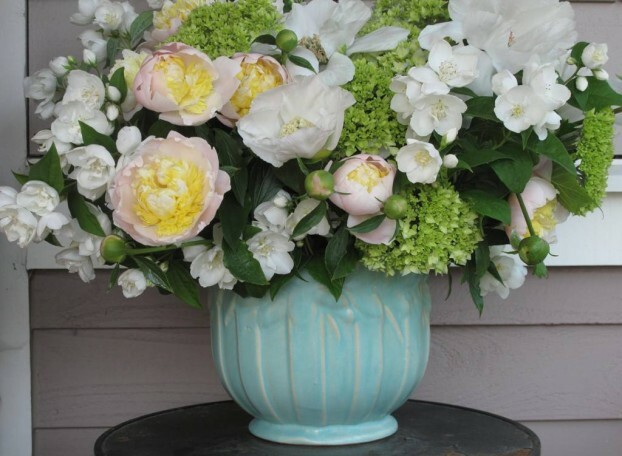 It’s the ideal scale vase for such blousy bouquets! Two types of peonies, both inherited when we moved to this home. So I don’t know the cultivars. I love the pale pink with the fringey yellow centers, but I think I love the single white variety even more, especially for its dense centers, some cream; some rose-tinged. Immature hydrangea stems, used as a lime green accent. Quite delicious to the eye and fragrant to the nose! This entry was posted on Saturday, May 30th, 2015 at 7:43 am	and is filed under American Grown, Blog Posts, Creativity, floral design, Gardening, General, Plants, Slow Flowers Challenge. You can follow any responses to this entry through the RSS 2.0 feed. You can leave a response, or trackback from your own site.